Promoting the participation of young people in political life is becoming a higher priority worldwide. Over one third of the 169 targets established as part of the United Nations Sustainable Development Goals (SDGs) relate to young people and the importance of their empowerment, participation and well-being. Twenty targets across six SDGs – relating to hunger, education, gender equality, decent work, inequality and climate change – specifically focus on youth. In 2014, recognizing the absence of systematic data and information on youth representation in parliaments, the IPU designed a first-of-its-kind database on the subject, to collect the relevant data through parliaments. The result was the first report on youth participation in national parliaments, which was published in October 2014 and updated in 2016. 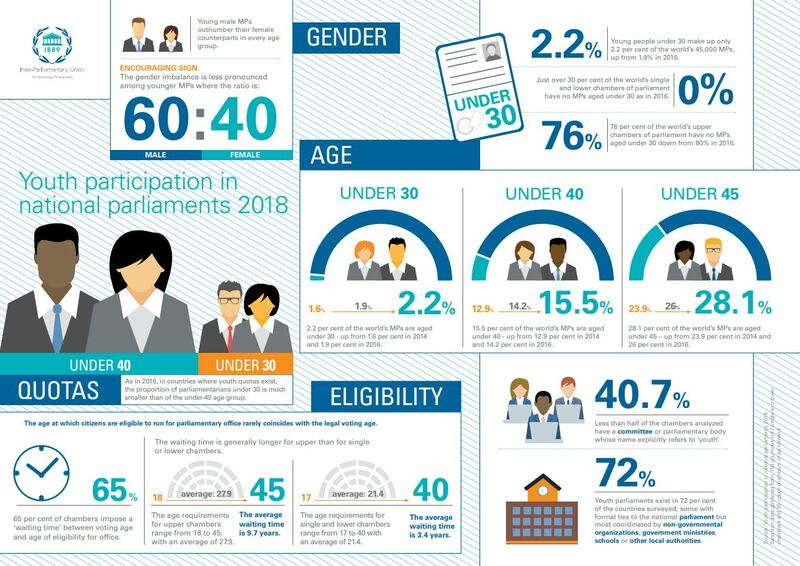 This 2018 report provides updated information on the percentages and genders of parliamentarians under the ages of 30, 40 and 45, as well as the latest information on special mechanisms designed to encourage or enhance the participation of young people in national parliaments. Young people under age 30 constitute just over 2 per cent of the world’s parliamentarians. 15.5 per cent of the world’s MPs are under age 40 – up from 14.2 per cent in 2016, an increase of 1.3 percentage points. 28.1 per cent of the world’s MPs are under age 45 – up from 26 per cent in 2016, a 2.1 percentage point increase. The global proportion of MPs under age 30 has increased by only 0.3 percentage points since 2016 (from 1.9% to 2.2%). 2.2 per cent of the world’s MPs are under age 30 – up from 1.9 per cent in 2016, a slight increase of 0.3 percentage points. Male MPs continue to outnumber their female counterparts in every age group.